November 4, 2013 · Best Practices, Flipped classroom, How to flip a class, How to flip your classroom, Implementation, Measuring learning, Peer Instruction, Research, Resistance from colleagues, Scientific Teaching, What is a flipped classroom? In a recent article on flipped learning in USA Today, Nancy Lape of Harvey Mudd College reports finding no statistical difference in students’ learning in a study comparing a “flipped” and a lecture-based classroom. She states: “(The professors’) lives might be easier and their students might be happier if they just do a traditional class.” (Since this posting, questions have surfaced about the quality of the reporting in the USA Today article and members of the research team have provided more accurate depictions of the study here). From a scientific teaching perspective, Lape makes what seems to be firm conclusions that are disheartening (and perhaps misguided) based on what she readily admits are “preliminary” findings from a pilot study. Innovation, pedagogical or otherwise, always involves multiple iterations. What would have happened if Thomas Edison quit the first time he saw dark when he flipped the switches in his lab? A scientific approach to teaching innovation is no different: It involves (or should)! rigorous experimentation before you close the book on the first try. Moreover, is making our lives easier and our students happier the purpose of education? Is this what we imagine our jobs to be as teachers? Or is the real Holy Grail designing educational experiences that transform students’ learning worlds and prepare them to thrive in the future? During the 2010- 2011 academic year, Peer Instruction Network Members Troy Faulkner and Rob Warneke embarked on a quest to reach this ultimate goal. They were looking for something to help their students chart new paths as mathematically confident and proficient learners. They saw great opportunity in the Flipped 101 Model, where instructors put lectures online for students to watch before coming to class; during class, students work on homework problems with their peers with an instructor close by ready for any critical intervention. When they flipped their classrooms at Byron High School, they were surprised at the results. Rob and Troy were able to improve student achievement by a few percentage points on proficiency exams over lecture. Their transition to flipped teaching took a lot of effort and energy. Seeing their students improve just a bit and not radically, Rob and Troy didn’t throw up their hands and revert back to tradition to make their lives easier after just one try. Turn to Your Neighbor interviewed Troy and Rob at FlipCon13 about what they did next and why they stuck with their Flipped 2.0 version. They moved direct instruction out of class with lecture videos, and used Peer Instruction during class time, what they refer to as the Peer Instruction Flipped Model. I think their story provides a helpful example of how multiple iterations are part and parcel of flipped learning and how their hard work has paid off for them and their students. TTYN – What do you teach? Your first implementation of a flipped classroom was 1.0. What did that look like? RW: Your typical Flipped 101 model, students watched videos at home and came to school and worked on homework in class. Then you transitioned to Flipped 2.0, using Peer Instruction*. How did that come about? RW: We were trying to make learning better. We always measured success with proficiencies on tests and we wanted to keep improving. So we watched exam results closely. We asked ourselves, “What could we do with the in-class time besides watching students do their homework?” We tried a lot of different things based on student feedback, including quizzes. When I researched how to best utilize that in-class time, I came across Peer Instruction. How did you come across Peer Instruction? Troy, how did you get on the Peer Instruction bandwagon? RW: At our school, we have a Professional Learning Community (PLC), and with the PLC’s support the transition to Peer Instruction was quick and easy. When you walk around the Peer Instruction classroom and you see students getting it, what’s that look like for you? RW: I remember every time that happens, because that’s the creme de la creme. That is the thing you are waiting for! Tell me about an “Aha” moment for a student that you recall? RW: Graphing linear inequalities, a lot of kids struggle with this. As they were going through the questions I put up, I was walking around and listening to their conversations. Eventually, I started hearing “Ohhhhhhh” and I just love that…”Ohhhh, that’s why.” Students have a peer comfort level and I don’t think I could have gotten there with them with that level of sincerity. 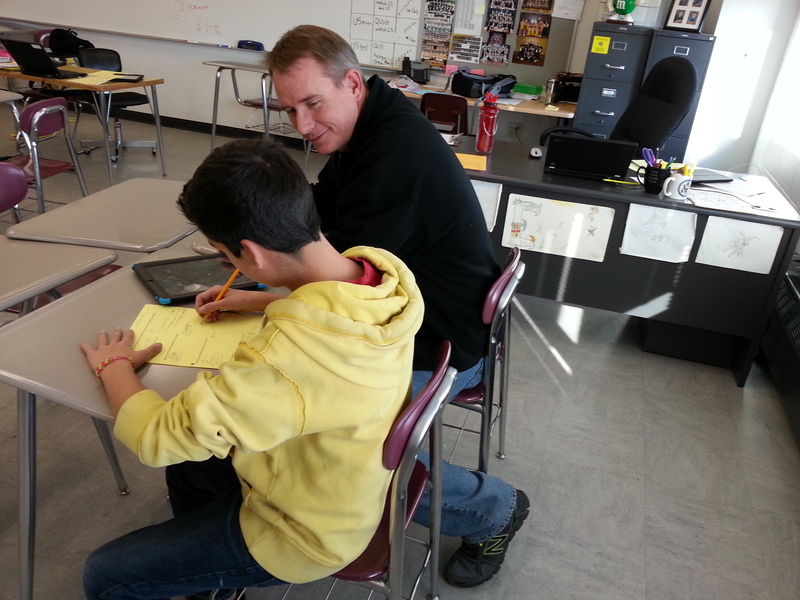 Rob Warneke helping a student after his Peer Instruction flipped class. Some people resist Peer Instruction because they think it means you can’t lecture. You lecture a little. Tell me about that. RW: I’ve lectured for 18 years. But, I rarely see those kind of Aha moments when I am talking! In lecture, the only feedback you get from students is are they looking at me? With Peer Instruction you are floating, and you hear their dialogue and you can determine where they are at. It is hard for them to talk to you mathematically even if you have a good rapport. You wait for that conversation as a teacher, but it never comes. But with Peer Instruction, students are discussing mathematical specifics and you hear their conversation around those specifics, more often and more clearly. What have your achievement results looked like since this conversion to Peer Instruction? TF: I am able to look at how my students do from test to test in Algebra II, Pre-calculus and Calculus. And, I can look at how they do overall. When I look at my overall results at the high school level, I measure the number of students who are at 80% or above on formal assessments. My Flipped 101 results compared to lecture in high school Calculus were up by 3.4%; when I switched to a Peer Instruction Flipped Model, my results were up by 12.1% compared to lecture alone. Maybe these were just better students? All of my Calculus students are seniors, so they have taken the state math test before I get them, and I look at those results. For some reason, that year, their average on the state test was 15% lower than previous years. That is a big drop. I knew I really had to work hard with them. And we work from the philosophy that you must work to help everyone, no matter who you get in your classroom. I always want to try to beat my last class’ performance. At the end of the year, this low-performing class ended up being by far the top performing class I have ever had and I celebrated that with them. What about achievement in your courses, Rob? RW: We designed a new Geometry course and we have cut our failure rates in half moving from Lecture to a Flipped 101 model (from 12% to 6%). We haven’t not measured this with a Peer Instruction flip…yet. Troy, you teach Statistics at a four-year college and you also transitioned to Peer Instruction there. How did that play out? First of all, when I surveyed my college course about the Peer Instruction model, 100% said they preferred Peer Instruction Flipped Class over traditional lecture. In addition, the class average went from 81% to 87%. Does anything stand out to you as really important in that transition? I had a student in my college-level statistics class who had high math anxiety and low confidence. She had signed up for my Statistics class when I was teaching it traditionally, with lecture. For personal reasons she dropped out of the class. She signed up for my class again in Spring of 2013, and I started the first day with a lecture saying,” I am not going to lecture, I am going to use a Peer Instruction Flipped Class.” I used Peer Instruction throughout the entire course. “Due to personal reasons I had to drop this class the first time I enrolled. I just completed the course, taught by the Peer Instruction Flipped Model. As a student who attended both models, the Peer Instruction model provided an active learning structure. I know I wouldn’t have been successful in a lecture class. I need more time to understand the material, especially math. I have always struggled with math, but this model provides me with a less stressful and more successful environment. What does this feedback mean to you? TF: I was doing something different that allowed her to succeed. I wasn’t the roadblock keeping her from her career goals. The whole idea that I was able to allow her to be successful and helping her learn and not just her but all my students to learn at a higher level and have more confidence with math, was really important to me. Now, isn’t this the very purpose of education? *Peer Instruction is one research-based way to flip your classroom. Follow Troy on Twitter by clicking here or email him at troy.faulkner@flippedlearning.org. Peer instruction helps motivate students to read, do homework. People like to show what they know. They enjoy being helpful and so will prepare beforehand so as to be more knowledgeable. You’re preaching to the choir here, Julie. This could/should serve as part of a well referenced rebuttal in an editorial column!